This is a wonderful winter dessert. It is not overly sweet and has a fresh flavor from the tart cranberries and the in season oranges. It is a beautiful dessert to serve for company. They will think you went all out just for them, but only you will know it is easy to make. It will be our secret. Preheat oven to 350 degrees. Grease a 9-inch ceramic or glass pie plate. Toss cranberries with arrowroot, spread in an even layer on bottom of prepared pie plate. In a mixing bowl add almond milk. Add the flour, maple syrup, orange juice, orange zest, vanilla extract and sea salt. Whisk all ingredients so that they are well combined. Beat the aquafaba until stiff peaks are formed. Fold in aquafaba into batter. Pour batter over cranberries and sprinkle coconut sugar and almonds over batter. 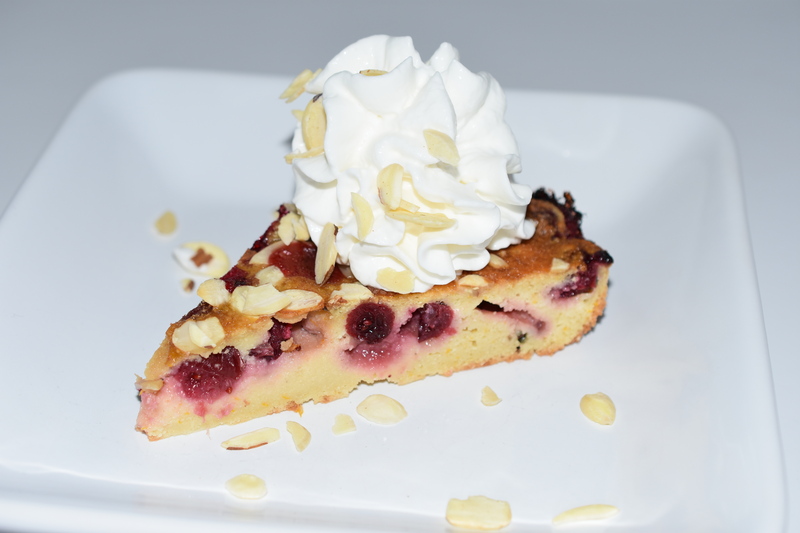 Bake until clafouti is puffy and golden, and a knife inserted in center comes out clean, 50-55 minutes. Remove from oven and let cool for at least 15 minutes. Slice into 8 pieces; serve warm or at room temperature. Top with whipped coconut cream.